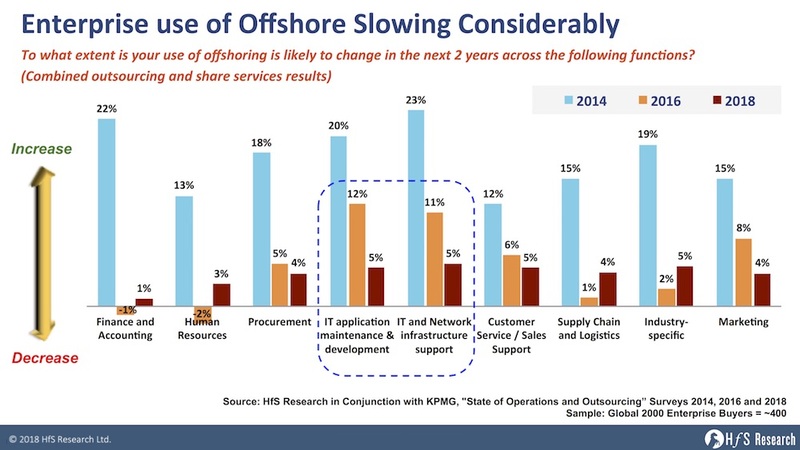 I discussed this trend with one of the lead partners at ISG, the offshore outsourcing industry's largest deal advisor, and he shared that Trump's stance against offshoring was considerably slowing down the deal cycle for his firm, and he was even seeing some outsourcing deals going to the likes of Accenture and IBM because it created the façade that work was not being offshored (even though it was). Yes, this is the kind of stuff that happens when a president likes to get fast and loose with his twitter account! However, while Trump's open attacks on American firms using offshoring stoked panic into many paranoid C-Suites, what really transpired was a rapid shift in how US firms are viewing their partnerships with global service providers. Today's reality is technology has become core to business competitiveness by creating new revenue channels made possible by interactive communications technologies with customers, by simplifying business operations to support the business with real-time data, and by supporting broader processes that respond to the needs of customers, as they occur. Many enterprise leaders are clearly no longer thinking, "How can we shave some more cost off our annual IT budget by moving more work to India?". Instead, they are thinking, "How can I get quality services delivered at competitive prices that take advantage of the cloud, automation, and global talent." The subtle shift here is clearly one from an obsessive focus on low cost, to one of getting quality services as the industry matures, where there are many leverage points to find productivity gains, beyond merely relying on FTE rates. The more pricing shifts towards outcomes, volumes and KPIs, the less visible offshoring becomes as a cost-lever. When you buy electricity, do you care where the supplier houses its generators? When you use public cloud services, do you bother to question Google, Amazon or Spotify where they house their massive data farms? It's the same when engaging with IT services firms to get work done: business operations leaders are barely thinking about where they are located anymore - and all President Trump has done is shifted the optics, compelled the leading India-heritage firms to make substantially more onshore staff investments - which they needed to do in any case - as the nature of IT work is driving the need for greater client intimacy and physical proximity between service delivery staff and client staff. This data speaks volumes - enterprises digital leaders need providers which can work with them to achieve outcomes that are increasingly challenging - most no longer requisition 500 developers per year to code in ABAP for strategic initiatives - that is a commodity practice today, usually delegated to lower level manager to lead. 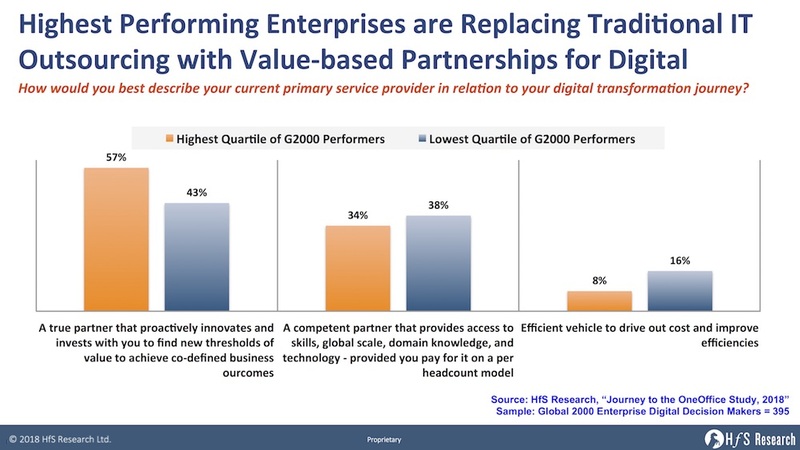 Nearly all G2000 firms, today, have a Chief Digital Officer tasked with taking their companies through significant business model change, enabled by smart technology provided by partners which understand what is required. Whether the talent for these strategic projects resides in Bangalore, Basingstoke, Bucharest or Baton Rouge is moot - this is about getting results where top talent is hard to source, and the location is just not very relevant anymore. Trump's stance on offshore outsourcing sparked two behaviors which have set up the future of services to be far more value-driven and business oriented: All the major Indian-heritage service providers have been aggressive adding 10,000+ staff right across North America and Europe. Several are also embarking on ambitious acquisitions of niche onshore digital firms (both creative and tech-driven) to engage themselves higher up the foodchain within their clients and be considered for more lucrative digital engagements where there are deeply engaged with their clients redesigning business models that need sophisticated technical support. So while the industry suffered from a couple of flat years trying to squeeze the last vestiges of life out of a dying body-shopping model, the new reality is a global delivery model that is now embedded in engagements where the focus is much more on business value and outcomes than prehistoric effort-based inputs. We are also entering an era where the likes of Cognizant, Infosys, TCS and Wipro will cease to be called "Indian providers" and merely be referred to as global IT services firms. Location is irrelevant... expertise most definitively is not. Japan is currently the only major developed country that is experiencing a population decline. Unlike other developed economies, it is not offsetting population decline with immigration. In addition, Japan has the largest proportion of elderly citizens of any country in the world. In 2014, 33% of the population was over the age of 60 and this percentage is increasing. Given its shrinking productive population, combined with its wealth, the cost of labor is high. Can Infosys be the one to challenge Accenture's digital services dominance? It took a while, but we've finally seen the cards being played from Infosys' new CEO Salil Parekh - and it's a concerted digital play to offer clients an alternative to Accenture. Make no bones about it, the intentions are crystal clear to reverse the course Vishal Sikka set with a software-centric "product" approach, and follow the Accenture model of creative digital services supported by technology-agnostic execution. The firm, once affectionately dubbed the "Indian Accenture", has gone full circle to reclaim its mantle and revitalize itself as one of the key services alternatives to enterprise clients seeking high-value digital capabilities enabled by industrial-scale technology execution. Infosys has never been one to go about its business quietly - the firm likes to make big bold statements and attack the industry with a swagger - and, after a full year of navel-gazing as Sikka's reign fizzled out, amid a very public media obsessed with scrutinizing every private jet excursion and every former SAP executive's departure package, Salil has made his play in typical Infosys style. With the chest-beating battle cries coming out of the firm's Q1 results, Salil and his new founder friends believe they have the credibility, brand and global presence to slip in front of its rivals, notably Cognizant, TCS and Wipro, and to make up for lost ground and quickly assert their presence in this digital race for client supremacy. The (surprisingly open) stated effort to sell off their product acquisitions Panaya and Skava (and likely more), the recent acquisition of creative agency WONGDOODY, famous for its Superbowl ads, and its 2017 addition of London-based product design agency, Brilliant Basics, gives Infosys a creative digital footing in both US and Europe. For all Vishal's intelligence and vision, the reality became very clear towards the later stages of his tenure as Infosys CEO: traditional IT services firms will always struggle to become products-plus-services firms as they simply do not have the channel to market, the sales structure or the culture to sell these offering at a one-to-many scale. "SAP has 45,000 clients while we only have 1,200" was his realization. Services juggernauts like Infosys are never going to scale effectively down to the lower middle market, hence need to deepen their footprints with large clients which are profitable to manage in their global delivery model. And remember Accenture's aborted attempts to make a mid-market play? A one-to-few model may work in very specific areas such as procurement (Accenture and Procurian) or healthcare (Cognizant and TriZetto), but these investments are substantial and require a significant amount of time, focus, and investment to make viable. This is why Salil made the aggressive decision to abort Panaya and Skava - these require a massive effort to deepen sales and delivery capability to make these investments truly worthwhile and pivot Infosys into a much more specialized direction. The realistic growth for a firm like Infosys is in winning big-ticket enterprise services accounts on long-term deals that require significant scale and transformation. There is a reason TCS is leading the services industry in valuation - it has its tentacles firmly wrapped around large, multi-year client relationships and is not bogged down in discreet product acquisitions. 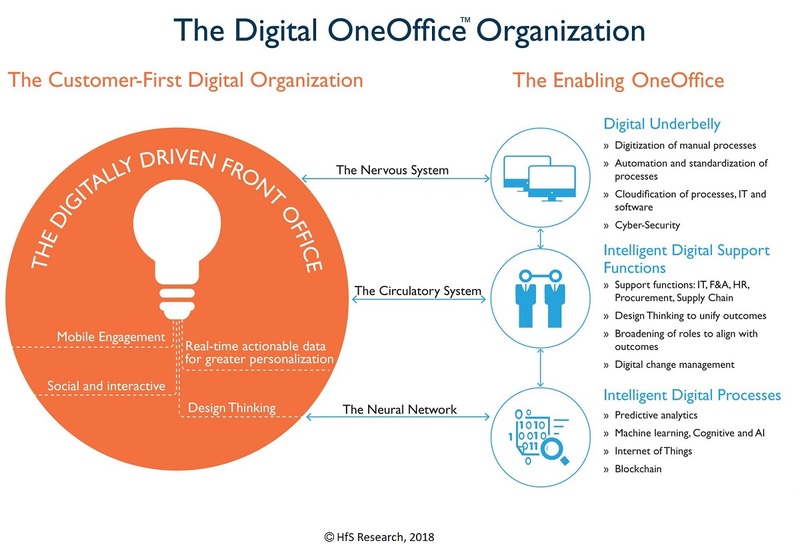 Digital services represent the high-value end of the services business where firms like Infosys can embed themselves for many years if they get this right - the ability to design, manage and deliver the customer engaging front office, supported by a digital underbelly, support organization and predictive analytics (as we at HfS term the "Digital OneOffice"). It is that ability to enable clients to respond to the needs of their customers in real-time: Digital is the wow factor that is setting apart today's services firms. The reality is most of these providers are competent at delivering IT services at scale to meet whatever KPIs were agreed at the onset of a contract. So the differentiation is that ability to help enterprise clients delivery the digital experience for their own clients - and you can only really do this if you have absorbed sufficient design and consulting talent at scale. Digital is much more about a services experience than a specific product experience - there are many apps and tools clients can use, but it's how they are aligned with the business strategy that really matters. This is why Accenture's technology agnostic strategy of the last two decades is the one so many services firms are now following. Three small-scale acquisitions are merely a statement of intent, but the hard work starts now - and it is a serious about of hard work! While WONGDOODY and Brilliant Basics are very credible firms and get Infy on the map for digital design and media services, Salil and his cohorts need to savage the market with some further significant investments if it wants a place firmly at the big boys' table. 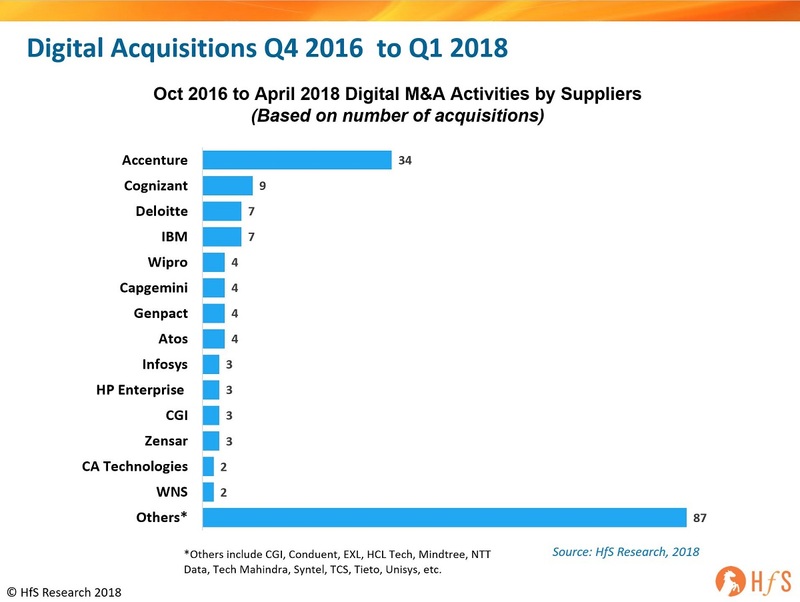 Cognizant has done an excellent job taking its SMAC stack into a very meaningful effective digital offering, and currently is pushing Accenture the most aggressively, with focused offerings and marketing. Wipro has made some admirable efforts with Designit and Appirio to win some notable deals and has been very focused on this space, vastly improving its communication and positioning with clients. The reality is, no one has come anywhere close to rivaling Accenture's scale with digital and we need to see a lot more than some small agency investments if any of these firms want to make a realistic play at Accenture's dominance. Firms like Infosys now have to bet big if they want to do more than pay lip service to the new wave of technology-focused offerings. A major consulting acquisition, such as a Booz or AT Kearney, could make the difference, but will likely be a one-shot deal to make or break their strategy, and we all know how messy these services-plus-consultant acquisitions can get. The bolder play is to go after one of the large creative media/advertising agencies that offers clients and scale that get Infosys immediately to the table. Firms like AKQA, BBH, M&C Saatchi, Ogilvy & Mather, Sid Lee and the Miller Group (to name a few) would deliver immediate credibility and digital design capability to a firm as ambitious as Infosys. Infosys has the swagger to pull something like this off, but has never faced such a test of focus as it does right now - it has picked its path, now the firm needs to pace some serious, eye-catching investments to stay true to its word. Most importantly, the Founders needs to stay true to Saili and not have him experience the wheels come off like they did for Vishal - that is not a road Infosys can afford to go down again, as next time there won't be a forgiveness factor from its clients or the industry at large. Everyone, seemingly, is obsessing with the current swirl of anxiety infecting our whole career outlook, with relentless discussions raising our stress levels as we figure out how to "adapt" ourselves to a world where bots are going to do so much of our work at some indefinable moment in the future. Whiplash alert: You may have noticed how Gartner recently flipped its core messaging from automation/AI being a seismic job destroyer to being now a job-creator. And both times, they just can't seem to back up the rhetoric with actual facts. Plus, they don't even seem to be able to define consistently what they actually mean by "AI Automation". Peter Sondergaard, Gartner's Head of Research, predicted one in three jobs will be converted to software, robots and smart machines by 2025. Yes he actually said that at his own Symposium, and even added, "New digital businesses require less labor; machines will make sense of data faster than humans can." However, unlike the good old days when analysts could get away with all flavors of outlandish grandstanding soundbites to spice up a conference, these predictions tend to hang around the internet these days. While many people love to keep spinning new headlines everyday, in the hope #fakenews is now the #realnews, some of us still have memory banks that last longer than one week, especially when CIOs spend billions of dollars for this type of council. Fed up with even the hype being so overhyped, that even The MIT Media Lab is severing ties with a brain-embalming company that promoted euthanasia to people hoping for digital immortality through “brain uploads"? Yes really. Click here to reserve your virtual seat now! If I had a dollar every time an executive bemoaned their firm’s inability to “change their mindset”, to do anything differently to escape their habitual ways of running operations. And if I had a further greenback for every advisor who bemoaned how idiotic their customers are, because they “just don’t have the deep expertise to fix their underlying data structure", I would have long retired to the Trappist Order to brew very strong beer for connoisseurs with beards (that doesn’t actually taste very nice, but it's just so beardy). Getting to the point here, it’s one thing demanding your employees change how they approach their jobs to benefit your firm from deploying advanced automation and cognitive tools, but entirely another if you don’t have the technical expertise to put them to work. It’s one thing to design a leading-edge digital interface with your customers, but it’s rendered pretty useless if you don’t have the capability to integrate it with your operations to provide customer support, get your products and services to them and harvest their data to keep making smart marketing decisions to stay ahead of demand. It’s one effort to redesign processes around your customers, entirely another to redesign your operational infrastructure to make it actually happen. As we have widely discussed, four-out-of-ten customers (see earlier blog) going through initial deployments of RPA software are struggling to meet the business cases and cost savings goals. And when we bring hundreds of enterprise leaders together at our HfS Summits, the story is consistent: business struggling with change, but they struggle even more with aligning the right technical expertise to work alongside their business talent. Simply put, today's firms are struggling with having IT depth to take their ambitious C-Suites where they want to go. So where do we go from here? IT is at the heart of C-Suite strategy - it's a business discussion that only works with the right IT capability. You only needed to eavesdrop on the many C-level discussions at Davos to know the IT discussion is firmly at the core of the business. Being able to satisfy your customer's digital business needs is where it's all heading. I was recently talking their the Group Finance Head at HSBC and his whole focus is on two elements - having the best digital app delivery and providing the best customer experience, which is incredibly challenging for any business environment grappling with differing compliance needs across borders, and ever-demanding customers wanting to do all their banking on an iPad. However, while this is a challenge, it is also a massive opportunity for the ambitious who get their business design and IT skillset equation right. Finding the right partners is more crucial than ever. There is a massive opportunity to lead in the world of IT services, provided you can plug these skills gaps. The challenge is breaking out of the traditional sourcing model to access niche talent across the globe in areas such as crypto-technology, Python development, Lisp, Prolog, Go and C++. While most traditional firms still rely heavily on bread and butter IT services delivered at scale from regions such as India, the emergence of talent in Central and Eastern Europe, China and parts of South America also need to be brought into play. The IT services world will be a very different place in a couple of years as boutique firms offering niche skills come into the fore. Not to mention the emergence of crowdsourcing for IT talent. Having really savvy IT leaders who can cobble together crack teams on-tap to solve their IT headaches is already becoming a huge differentiator for many firms. The will also be a role for the super services integrator, who can pull together teams for clients to work with them on complex projects. Simplification of business operations is the real key to future success. 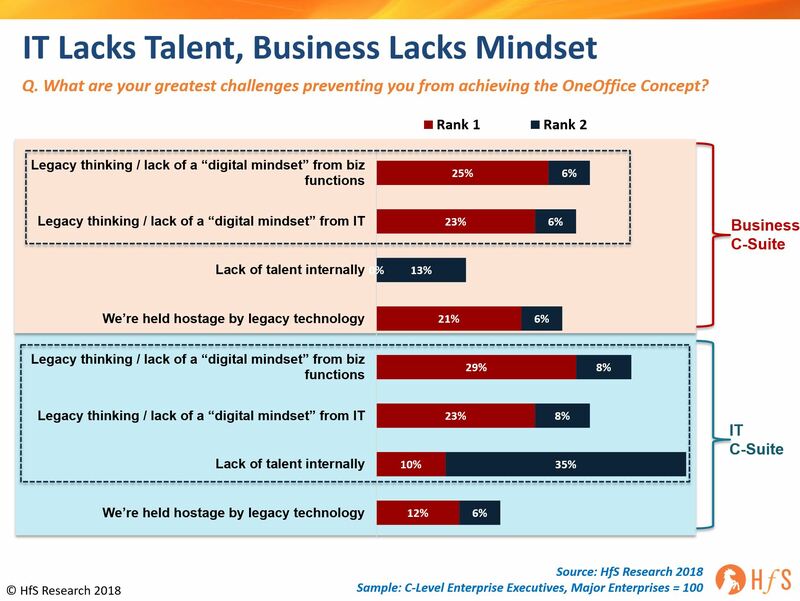 In short, there is no silver bullet to solve these endemic issues companies are facing to break out of legacy ways of working, but being able to align a determined mindset shift on the business side with smart IT skills to bring it to reality, is the only true way forward for firms who know their days are numbered, if they cannot change their inner workings to get somewhere near a OneOffice end-state. The future is really all about simplifying operations to bring them completely in line with the world of the customer. Hence, successful businesses need IT folks who can think logically to simplify business operations through the use of automation, cognitive, AI and digital. It's not just about software packages and APIs, it's about both business and IT staff learning to understand each other's strengths and challenges better. It's really not rocket science, it's about learning to simplify business models to stay ahead of your customers' needs and not giving your competitors a window to take you out of your market...because that may already be happening to you. As with every technology magic bullet, the conversation always reverts to “hammers finding nails”, as many executives long to revive the glory days of shaving more off their bottom line in order to achieve more attractive results. To this end, a financial controller of a FORTUNE 20 bank declared, “I had practically given up on ever meeting the demands of my various partners. Every time we were asked to perform, we just couldn’t connect the pieces. We tried every solution on the market, every tool off the shelf, even some special robots… we were a hammer trying to find a nail, but the nail just wouldn’t find the hole. Until we were introduced to blockchain, and suddenly everything changed…”. And when we managed to get Accenture blockchain guru, Peter North, on the phone who revealed, "Blockchain promises high performance delivered and we aim to deliver that high performance. Delivered."